We’re home! More to come later! Ellie had a much better day today. She is eating better, but it’s still a bit of a struggle to get her to eat. It’s much better than yesterday though. Each day will get better, I know. The good news is, it looks like she will still be discharged tomorrow! Today our nurse went over some preliminary discharge paperwork. We have already watched the video about the car seat, and watched the infant CPR video. If anyone wants a refresher on infant CPR, we have a kit (including MiniBaby for practice) that you can borrow. It was a pretty uneventful day. Ellie will have an eventful night though! During her bath tonight, they will remove the IV! Yay! And she’ll also have a “car seat test.” I had been hearing about this all week, and wondering what it was. Turns out, you have to bring in your car seat. They set it all up with the baby in it, and monitor the baby’s oxygen levels for 30 minutes. They want to be sure that the baby can make it home. If the baby’s head is too floppy, they are afraid that it will cut off the air supply. 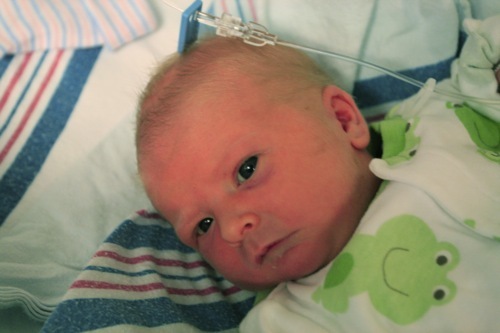 Most of the time they remove all the infant head wrap things and put 2 receiving blankets on either side of the head. I’m not sure why this is better, but that’s what they’ll do. Brian is stoked that we’ll get 2 hospital blankets. I just returned the 5 that we took when Samantha was born! Anyway, thanks for thinking of us all week. I’m glad all my family is almost all home! Has it been 4 days already? We are getting the hang of the parking lots, hallways, and NICU room at this point. I think Ellie is continuing to improve, but that doesn’t mean it’s not frustrating too. Originally, they told us that she needed a minimum of 72 hours in a crib, maintaining her own temperature, before she could go home. That would be Friday, at best. However, she is still not the best eater, so they probably won’t send her home if she’s “not a stellar eater” (in the words of our nurse yesterday). Part of me says it might just be HER, and part of me says it’s because she’s a preemie. She’s still not supposed to be here. Her jaundice went up in the morning, as expected, but it’s not high enough to use phototherapy yet. She is maintaining her temp ok. It was on the border of “acceptable” all day yesterday. At this point, we’re focused on eating. She just sleeps all the time, and doesn’t want to wake up to feed. 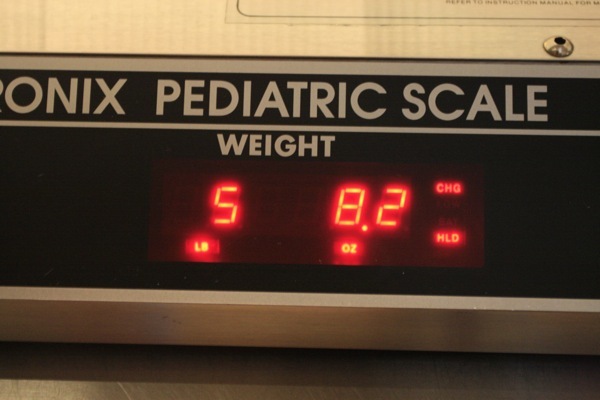 Last time they weighed her, I think she was down to 5lbs, 6oz. Because we are forcing the food, she’s not losing much, which is the point. I know we’ll get there. I know this is typical preemie stuff. Like I said, that still doesn’t mean the whole thing is not frustrating. 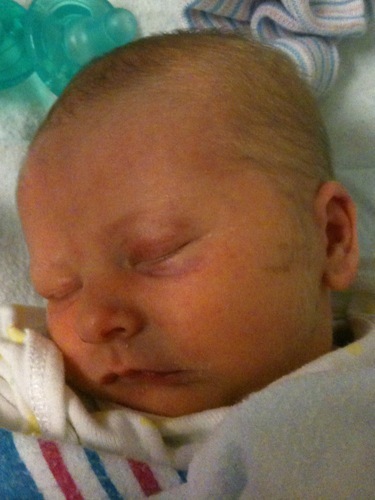 And a big kudos to the NICU staff. All of them have been great. It really takes a special person to care for these sick, sick babies. 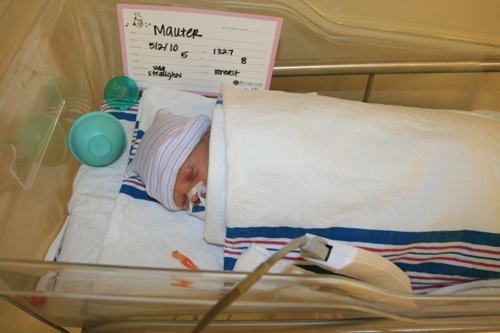 There was a baby born yesterday at 26 weeks, weighing less than 2 lbs! So compared to some of them, we’re doing great! This is the update for Tuesday. Ellie continued to eat well Monday evening and through the night. However, at her morning (9am or so) feeding, she was not very interested. She was moved to a crib around 10am and she began to spit up a lot. She was able to maintain her body temperature (on the cool side, but still within range) for the first few hours. She still had not had any dirty diapers, so the nurse was getting slightly concerned that she wasn’t passing anything. At her next feeding (around noon), she had a small dirty diaper, then we decided to try to nurse. She did very well (unlike the night before) but soon got sleepy again. Jaundice has set in (just a little – not at a high enough level yet to cause a bilibed, but noticeable) which causes sleepiness, and she’s not eating enough to have much energy. So we had a hard time getting anything else down her. She did have a major dirty diaper while we were trying to feed, so that’s progress! The nurse decided since she had two feedings that were not so good, they stuck a tube down her nose into her stomach to force the remaining food. She is doing well with her own body temperature. She needs to wear clothes now so we can help her keep as much warmth as possible. Brian and I had to watch a car seat video last night, and will watch a CPR video this morning. I’m not sure if they make all parents do that now, or only NICU parents. Here’s a picture from yesterday evening. I’m not sure why she looks like she has a black eye. I asked about it the night before, and they said it was because she was laying on her tummy. 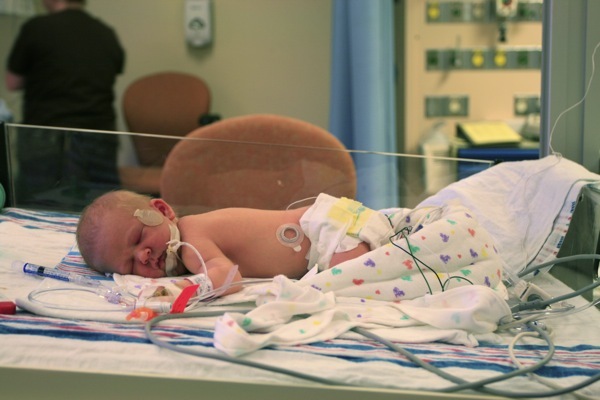 Even though you’re supposed to lay babies down on their backs, when they are first born, NICU still lays on the tummy because they will ball up more and feel more secure. Here, she has been on her back all day, and the one eye is still yucky. We’ll see how she looks today. Oh, and I was discharged from the hospital yesterday. 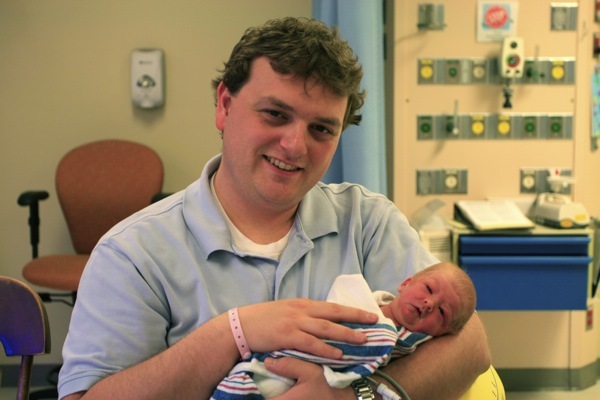 We were able to use the room as long as we wanted, so we used it all day, making coming and going from NICU easier. It was nice to sleep in my own bed last night though. Samantha is still at MamaLinda and Pop’s, so the house feels very empty now. Day 2 has been better. Ellie has come off nearly all of her medicines and tubes. The doctors have started letting her eat now that she’s keeping oxygen in her blood in strong amounts. At her 9PM feeding, the nurse removed her glucose drip. Ellie ate 33mL of formula. We were hoping for 30, so that’s great! Hopefully we won’t need to get back on that drip anymore. She still has IV, but it’s only for an antibiotic. In the morning if all goes well, they will move her over to a crib. She will still be in the NICU, but she won’t have all the junk hooked up to her. In a crib, you can more easily touch (still allowing only mommy and daddy to touch) and they will be closely watching her temperature. In the little bed she’s in right now, she’s on a heat lamp so she doesn’t have to use her energy to keep up her body temperature. The hope is that she can maintain her temperature without the lamp. Here are some pictures. The infant next to her is on a bilibed so the colors in the following pictures are most likely not up to our Adobe-certified friends’ standards.